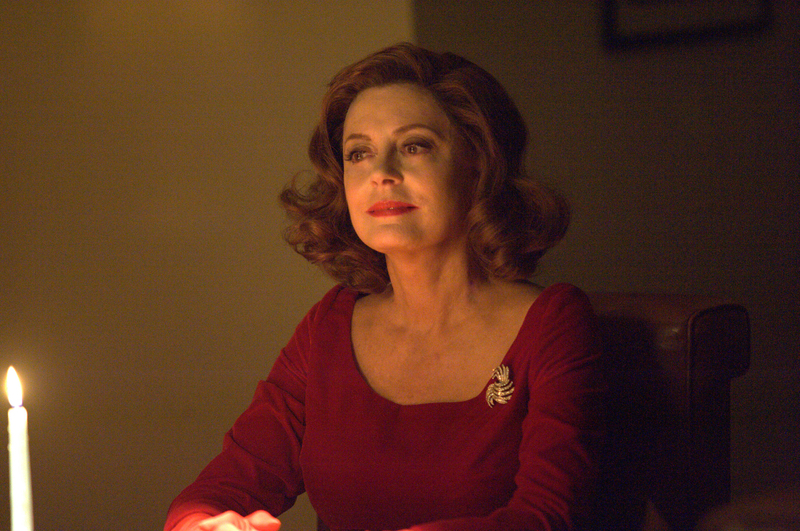 The Emmy-nominated costumes, makeup, and hair recreated signature looks for Susan Sarandon's Bette Davis and Jessica Lange's Joan Crawford for their legendary "Feud." 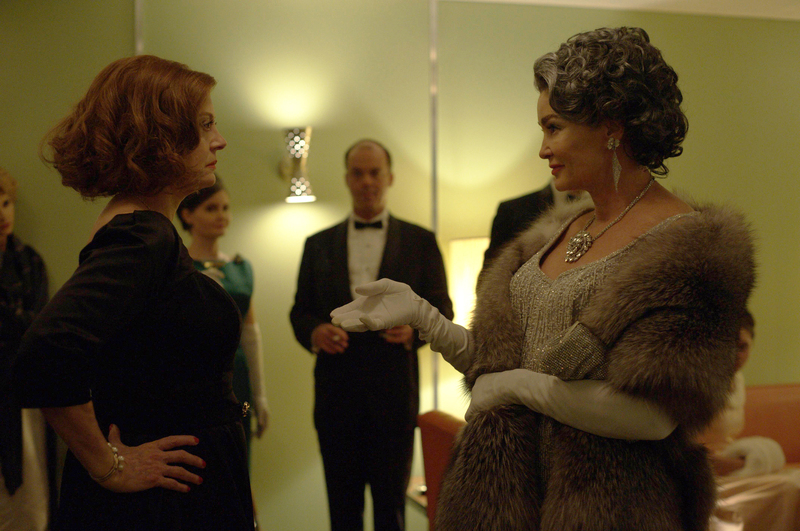 Old Hollywood retro glam makes FX’s “Feud: Bette and Joan” the perfect Emmy contender for costume, makeup, and hair. The bitter personal rivalry between Emmy-nominated Bette Davis (Susan Sarandon) and Joan Crawford (Jessica Lange), which heated up during their co-starring in the 1962 horror movie, “What Ever Happened to Baby Jane?,” was fueled by the fear and insecurity of two fading stars. Showrunner Ryan Murphy (“American Horror Story”) recreates the era when the studio system was in decline and the two once-bright stars were struggling to stay in the game. For Murphy’s Emmy-winning team of costume designer Lou Eyrich, makeup designer Eryn Krueger Mekash, and hair department head Chris Clark, it was an opportunity to embrace the twilight of Hollywood’s Golden Age in grand style. The two divas are a study in contrast: Crawford carried her glam with her at all times, trying to hang on to her glory days as a movie star. She never went out of her house without full makeup, and looked youthful for her age. Eyrich kept her in cool tones, icy blues, greens, and pinks. Davis was far more casual and comfortable in her own skin, a confident actress yet worried about losing her Hollywood stature and relevance. Davis dressed informally in warm, autumnal colors. Making “Baby Jane” intensified the divide between the two fading stars, and Davis knew how to get under Crawford’s skin. Eyrich first mimicked their signature silhouettes. Crawford accentuated her waist, was often sleeveless, and wore lots of jewelry. She was also a control freak and that influenced her wardrobe. Davis was pragmatic and more East Coast-influenced. Incorporating Lange and Sarandon, of course, required some tweaking to fit their looks and personalities. In terms of makeup and hair, it was a matter of conveying the constant glam of Crawford versus the less extravagant Davis. 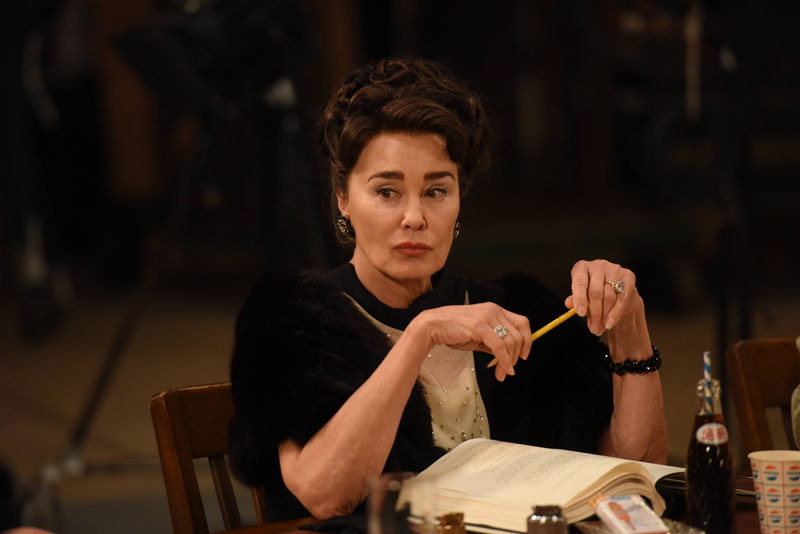 Lange wanted to avoid the “Mommy Dearest” cliche and Mekash went for an identifiable look from the ’30s and ’40s, with extreme eyebrows and highlighted lips. But, with Lange’s tan skin, it looked very natural. For Davis, the look was completely natural. There was no digital makeup for aging or reverse aging, and the period flashbacks were done with lifts, pulls, and highlight-and-shadow makeup, with select CG smoothing. Hairstylist Clark, who used 63 lace-front wigs (25 custom-built), divided the work into three looks: Everyday, glam, and “Baby Jane.” And since Crawford and Davis often changed hair color, he had to maintain a sense of realism for the actresses. Davis’ was red in the ’60s and Sarandon’s own red was made to highlight that. The blond Lange was fitted with Crawford’s chocolate brown. And Crawford’s hair was authentically dressed the way it would have been in the early ’60s with wet-setting and rollers. Crawford’s ultimate humiliation, despite all her best efforts, was witnessing rival Davis land the Oscar nomination for “Baby Jane.” She got her revenge through a smear campaign and conniving her way into accepting the Oscar on behalf of Anne Bancroft (“The Miracle Worker”). The work is a standout for all three nominees. Fortunately, there was plenty of research available about Crawford’s all silver look. The toughest costume challenge: good vintage fabrics are hard to find. For the silver beaded dress that Edith Head designed, Eyrich only had four days and a fraction of the actual cost ($10,000 to $20,000) to put it together. Fortunately, a colleague sourced the fabric in New York and they over-dyed it and added silver backing. The tailor then replicated the look and hand-beaded more beads as the finishing touch.